Our production company is named after the Pioneers of Filmmaking in Germany: The Skladanowsky Brothers. Using their Bioscope, they put on a very special circus attraction for the Berliners in the Wintergarten Variety (see box at the right side). 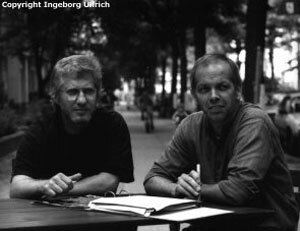 After having produced various Documentaries and Industrial films, Detlef Gumm and Hans-Georg Ullrich decided in 1976 to set up Känguruh-Film to enable them to have the possibility to produce films independently for television. In the end of the 1990s, the Känguruh team is joined the Producer Volker Ullrich. Since Spring 2001, Corinna Volkmann works at plot and project development in the company. Over the last ten years, many filmmaker, authors, directors, both young and old, came to Känguruh for help and support. Now Känguruh is expanding to be able to take on the many valuable stories people bring with them, using the experience and know-how which it has gained over the last thirty years in the film industry.